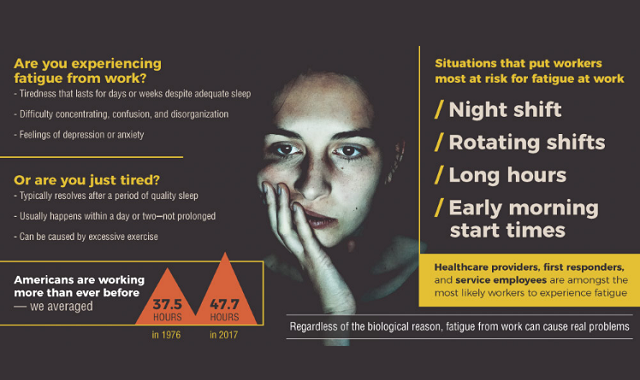 Psychology of Work Fatigue #infographic ~ Visualistan '+g+"
Back in 1976, the average American’s workweek was about 37.5 hours - in 2017, it was 47.7 hours. We are certainly working longer hours than we did just a few decades ago, but are we working smarter? Over 40% of workers say their job negatively affects their stress levels in a condition known as work fatigue. Fatigue is defined as a state of physical and mental exhaustion that goes beyond tiredness or ennui. In the human body, fatigue serves as a reminder that we should be focusing on something else. In evolutionary terms, feelings of fatigue were possible there to alert us to our needs, like finding food or shelter. While we don’t have to hunt for our own food today, fatigue can still set in and ignoring it can make the problems even bigger. Taking steps against work fatigue starts with simple changes in mindfulness and self-care but what results is a more fulfilling and meaningful work/life balance. For more detail on how to beat the work fatigue blues, take a look at this infographic below.